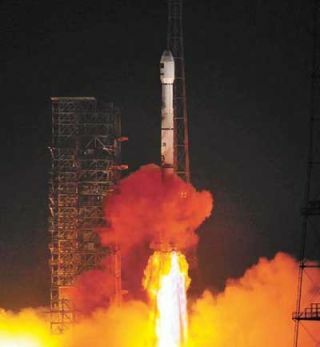 China deployed a communications satellite for Pakistan on Thursday, August 11, 2011, aboard a Long March 3B rocket. China deployed a communications satellite for Pakistan on Thursday aboard a Long March 3B rocket launched from a mountainous spaceport in the southwest China's Sichuan province. The fresh spacecraft, called PakSat 1R, replaces Pakistan's aging national communications satellite launched in 1996. The Long March 3B rocket soared off the launch pad at 1615 GMT (12:15 p.m. EDT). It was 12:15 a.m. local time Friday at the Xichang space center. The satellite weighed about 11,000 pounds at the time of launch. PakSat 1R was placed in an oval-shaped orbit stretching from a low point of approximately 110 miles to a high point of about 26,000 miles. Its orbital inclination was about 24.8 degrees, according to independent tracking data. The spacecraft will reach a circular orbit about 22,300 miles above the equator in the coming weeks. PakSat 1R will enter service after testing of its engineering systems and communications payload. Artist's concept of the PakSat 1R satellite in orbit. Stationed at 38 degrees east longitude, PakSat 1R will provide communications and broadcasting services to Pakistan and neighboring regions for at least 15 years. The satellite carries 18 Ku-band and 12 C-band transponders, according to Pakistan's Space and Upper Atmospheric Research Commission, or SUPARCO. SUPARCO is Pakistan's national space agency, which fields the government's Earth observation and communications satellites. PakSat 1R was built by the China Academy of Space Technology and is based on the DFH-4 spacecraft platform. China has reached agreements to build DFH-4 communications satellites for several non-traditional players in the space industry, including Pakistan, Nigeria, Venezuela, Laos and Bolivia. Thursday's flight was China's seventh space launch of the year. All of the missions have been successful.